My buddy waved me in. Some fishermen said they’d seen a shark circling us. I’d noticed them pointing out at us several minutes earlier. But I ignored them. They estimated the shark was twice the length of my surfboard. My board was 8 feet, 6 inches. They probably exaggerated their estimate by several feet. After all, they were fishermen. But I had no idea the shark was there. I never saw it. It still kept me out of the water the rest of the day. It’s rare for a shark to attack a person. Ironically, we focus on the big, unlikely risks and miss the likely, mundane ones. The risk of dying from a shark attack is 1 in 3.8 million. The risk of dying from injuries in a car accident is 1 in 84. And the risk of dying from heart disease is 1 in 5. So, I don’t let my near run-in with a shark keep me out of the ocean forever. I don’t let the obvious, more likely risks stop me from living life either. Trials, challenges and dangers are part of life. Don’t ignore or fear them. We’re rewarded when we overcome them. President Xi warned that China should guard against the black swan — but more importantly, fend off gray rhinos. A black swan is a metaphor to symbolize the dangers we can’t predict — like the shark attack we never see coming. A gray rhino, on the other hand, is the obvious danger we ignore. It’s the distracted driver coming at you, or the heart disease you develop from eating chicken wings every week. The gray rhino bearing down on China is its tapped-out banking system. The financial press worries about this. That’s fine — it’s their job. Again, don’t ignore the risks bearing down on China’s banking system. But don’t miss the opportunity on the other side of it. China sees that a vulnerable banking system is a danger to economic growth. It will fend off this gray rhino like it has so many others. When investors take notice, they’ll move money into the market. Last time China dealt with a gray rhino this way, investors could have moved into one exchange-traded fund (ETF) that more than doubled in 24 months’ time. Banks’ loan activity is sputtering. Government and business investment is disappointing. And the real estate market isn’t driving economic activity. The danger is that Chinese banks won’t be able to prevent a fast-coming slowdown in the economy. But China is doing something about it. The People’s Bank of China (PBOC) is injecting new stimulus in an unconventional way. It’s called the central bank bill swap (CBS). Since December, Chinese banks can issue perpetual bonds. These bonds are not redeemable, but they pay interest forever. Banks make money when financial institutions and investors buy these bonds. With the launch of the CBS, financial institutions can swap perpetual bonds for bills from the PBOC. Those bills are considered high-quality collateral and are as useful as cash. In layman’s terms, the PBOC is providing a reason to give money to banks so banks can issue more loans. Again, the PBOC is acting this way because Chinese banks are feeling the squeeze. Loan growth outpaced deposit growth by 20% last year. Without enough deposits coming in, it’s tough for banks to keep up the pace of lending. Inadequate capital also reduces banks’ ability to manage all the nonperforming loans on their books. But in the longer term, there are risks. On the one hand, it could worsen China’s debt addiction. And on the other, it could rekindle overcapacity that’s holding back several key industries, including real estate, autos and materials. Not long ago, China aimed to tackle those problems. In fact, the official newspaper of the Chinese Communist Party, The People’s Daily, discussed the issue over a year ago. And it used the same language about black swans and gray rhinos as President Xi did last week! In that instance, it warned that China needed to crack down on excessive financial risks and speculation. You shouldn’t avoid the market just because there is a gray rhino bearing down on China. China’s economy grew by 6.6% in 2018, the slowest pace in 28 years. Chinese officials don’t want that stat hanging over investors’ heads. China used stimulus to fend off gray rhinos before — and it’s doing it again. Sure, we don’t know how the central bank bill swap will affect the economy or markets. But it will complement China’s other stimulus efforts, which are easier to gauge. Twice last month, the PBOC cut the level of reserves it requires banks to keep on hand. This was after it cut its required reserve ratio four times last year. Similar cuts beginning in 2015 unleashed a strong rally in China’s stock market. 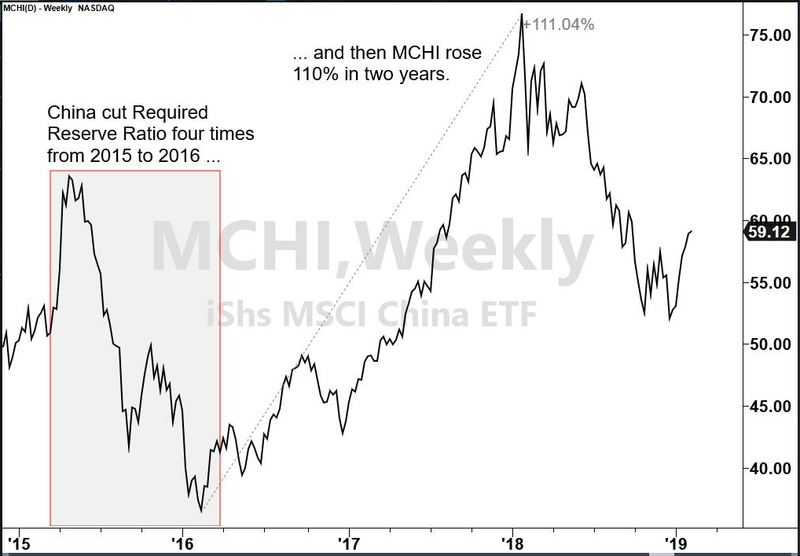 Beginning in February 2016, the iShares MSCI China ETF (Nasdaq: MCHI), for example, launched a two-year, 110% rocket ride. MCHI has the lowest expense ratio of the biggest broad-market China ETFs. And it’s weighted to large-cap stocks in the communications, financials and health care sectors. These are the future for China’s economy. It’s a good bet if the stimulus restores confidence in China’s stock market.